Regymen fitness powered by seacrest Fitness company launches sup fitness classes and events from bayview park in beautiful east hill. Regymen Fitness Pensacola provides the most comprehensive SUP fitness class schedule in the area. Stand Up Paddle Boarding is low impact, strengthens the core, tones every muscle, and gets you on the water enjoying nature. Come ‘walk on water’ with us and enjoy the worlds fastest growing water sport! We offer a variety of SUP Fitness workouts for all levels. Each class includes all the gear you need to be successful! Join Bill for a 'board meeting' on the water. Start your day off right by grabbing some miles before you head to the office! BYOBoard or rent one from us. This session is not instructional. Best for experienced paddlers. Take the 'ho-hum' out of your ordinary workout by combining the fastest growing watersport with a variety of exercises to ensure a full body workout. Discover the benefits of taking your workout to the water. Each class is designed for all levels. You must be able to swim. A SUP Tech class is recommend prerequisite but not required. Bring a buddy and try our simultaneous relay. One person paddles, the other runs on land, switching in the middle! When both have returned to the start, you've established your time. *Individuals can consecutively do both or challenge friends side by side. It's great cross-training! 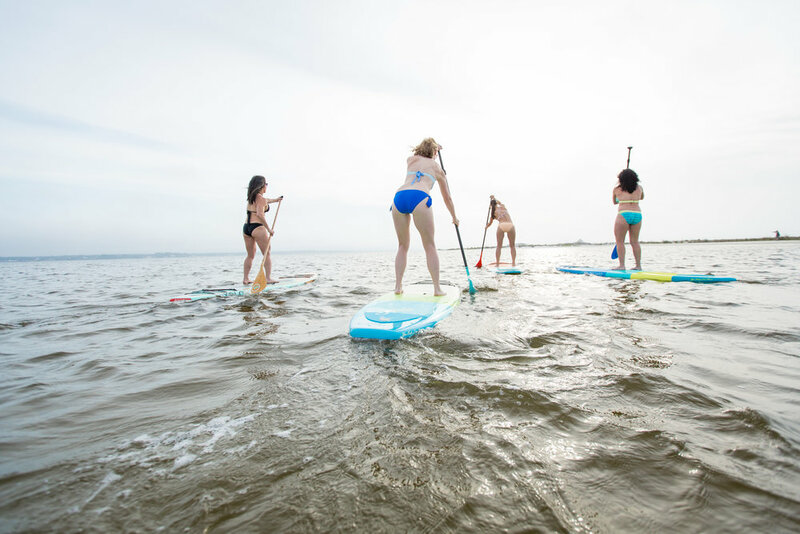 With the board as your 'mat' and nature as your backdrop, our Stand Up Paddleboarding (SUP) Flow class combines a leisurely paddle with yoga and pilates movements to improve balance, strengthen your core, and tone. SUP Flow is desinged for all levels however you must be able to swim. A SUP Tech class is recommend prerequisite but not required. Looking for a little more intensity? Join us for SUP Interval Training intended to build paddle endurance. Whether you are a novice or advanced paddler, our Mileage Builder promises a great workout on the water! Sharpen your paddle technique and skills at this weekly training session. BYOBoard or rent one from us for $15. Our Stand Up Paddleboarding (SUP) Tech class demonstrates the proper use of the board and paddle by introducing you to proper paddle stroke, stopping, and turning. Excellent for beginning paddlers or those that want to hone in on their paddling technique. You need no previous experience, but should know how to swim. Class is open to all fitness levels. Rise and Shine Paddle. Begins June 1st. Rise and Shine! Let's greet the day on the water each Friday with a sunrise paddle at 5:30 a.m. Join us afterwards for a cup of coffee to kick off your weekend. Bring your own board or we will provide one for you. Our sunrise paddles are FREE but please register so that we know to expect ya! Interested in Private Lessons or other SUP related events? Please visit YOLO Board Adventures Pensacola Beach in our top navigation.